The Fellowship was fortunate enough to obtain a copy of CLAY COUNTY from Arcana. The story is by Bruce Brown and Chip Christell with art by Adam Mrozowski. 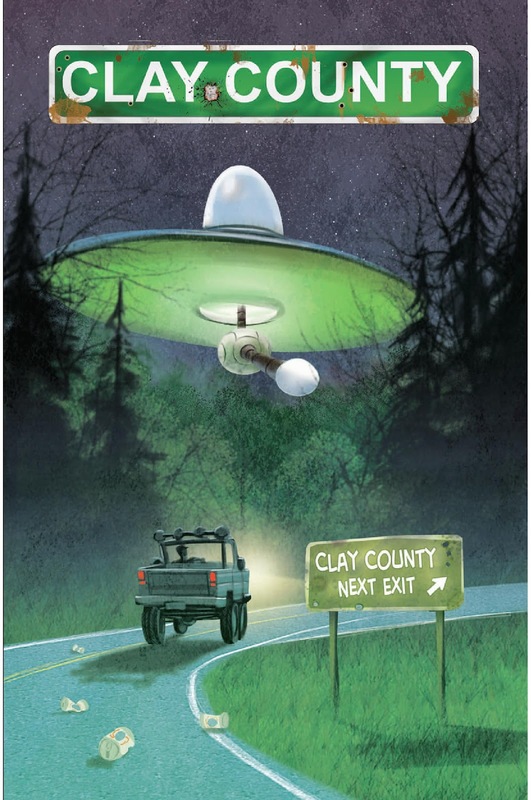 The aliens invaded Earth three years ago are approaching Clay County in an effort to acquire SF-92. The only thing that is in their way is the last member of the resistance – Sergeant Coleman. He encounters four rednecks who don’t know nor care about the aliens…that is until they destroyed the bar where they hang out. Even then, they are more concerned about drinking beer. Coleman must organize the rednecks in order to aid him in fighting back and restoring Earth’s freedom. Good luck with all that! This was such an entertaining graphic novel to read! It’s dumb redneck humor, but it is so smartly written. CLAY COUNTY plays like a summer movie – bits of absurd action and laugh out loud humor. You have to feel for Sergeant Coleman – he is so frustrated dealing with the stupidity of the rednecks. Mrozowski’s art and coloring sets a great eerie mood…very much like a 50’s sci-fi film. If that was the goal, then mission accomplished. Overall, this graphic novel is a solid read and worth picking up. CLAY COUNTY is available for order at www.arcana.com. Discuss in our Forums page.